Many national and local builders are busy building active adult communities for active adults over 50 in towns all over South Carolina. 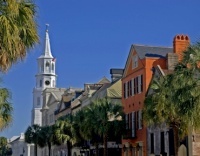 See our article: "10 Best Places to Retire in South Carolina" and "A Short Visit to Kiawah and Seabrook Island"
The South Carolina climate is called humid-sub-tropical. Summers are hot and humid and winters are mild. It is a bit cooler near the ocean and in the western mountains. Living in South Carolina is less expensive than many other states. Inflation adjusted 2016 household income of $46,898 was $7000 below the national median. South Carolina’s median home value was $157,600 in early 2018, according to Zillow (the U.S. median was $215,600. Prices are higher in urban areas and selective active adult communities in places like Hilton Head. The Greenville SC median home price was $206,200 (NAR), Spartanburg's was $168,200, but in pricier Charleston the median was $273,100. South Carolina’s cost of living is the 27st lowest in the nation (MERIC). Tax Burden: At 8.4% South Carolina is a very tax-friendly state with the 42nd highest tax burden in 2012 according to the Tax Foundation. Marginal Income Tax Rates. Income tax ranges from 3% - 7%, with the highest bracket kicking in at a low threshold for couples - $14,400. Those brackets are quite low, so for people with significant income, income taxes could be high. Residents can take all deductions and exemptions available on your federal return. Retirement Income Exemptions. People up to age 65 can deduct up to $3000 of qualified pension income. Each resident 65 and over has an exemption for the first $15,000 of qualified retirement income.Most disability services are not taxable. Here is a link to the SC Dept of Revenue page. Social security exemption. Social security is not taxable. Sales Tax: State sales tax is 6%, local communities can levy additional sales taxes. Property Taxes: SC is the 31st highest state for property taxes with $1077 paid per capita in 2013. Homestead Exemption. People over 65 might be eligible to exclude $50,000 of market value from property taxes. Estate and/or Inheritance Taxes. The state does not collect inheritance taxes or estate taxes. South Carolina does not have a certified retirement community program.